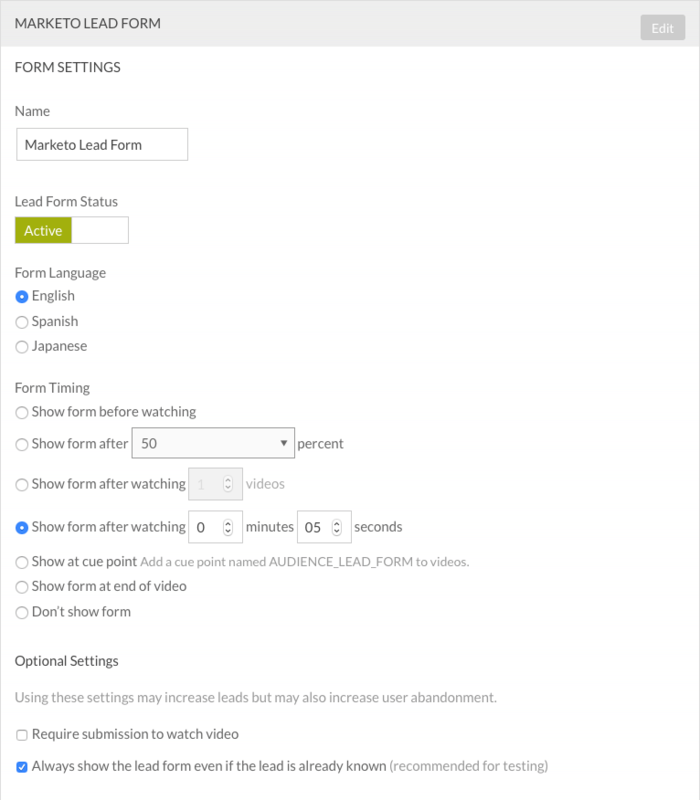 The Audience module provides the ability to create lead forms which allow you to capture viewer information as videos are played inside of Brightcove players. This gives you the ability to include whatever fields you need (visible or hidden) and also give you the ability to take advantage of features like progressive profiling (if available). The lead data is sent to, and processed by, Marketo. Optional - Style the form using CSS. Copy the form embed code. 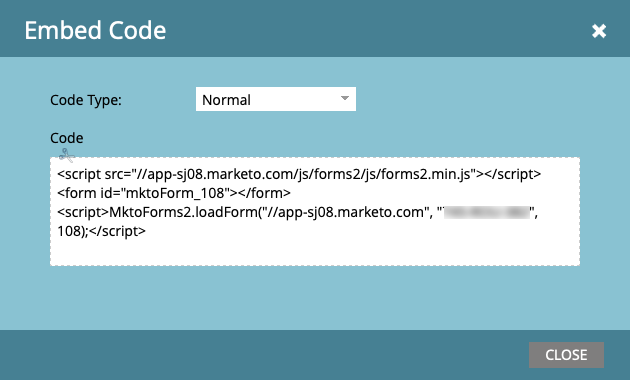 Validate the form data in Marketo. 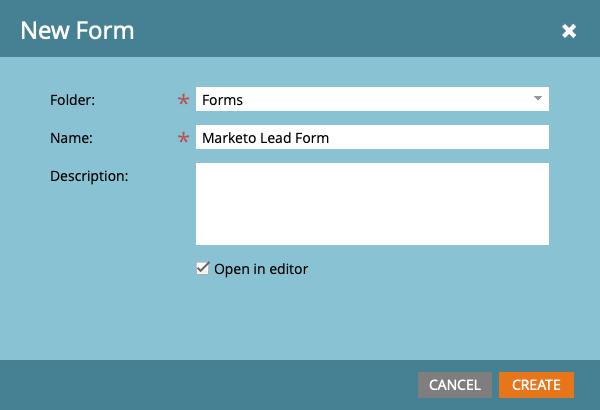 Marketo provides the ability to create forms to capture viewer information. These forms can be displayed inside of Audience-enabled Brightcove players. The data that is captured can then be used in customizing future communications. The steps below will create a simple form to capture first name, last name and email address. For complete details on Marketo Forms, see the Marketo documentation. Sign in to your Marketo account. Navigate to Design Studio > Forms and then click New > New Form. The New Form dialog opens. Enter a Name for the form and click CREATE. The form properties page will open. Click Edit Form at the top of the page. The form designer will open. By default, first name, last name and email address fields will be on the form. Edit the field properties and behavior as needed. Click NEXT. Click the arrow icons to select a form theme. The form theme controls the styling of the form. Click Preview Draft to see a preview of the form. In this example, the Dark theme was selected. Click Edit Draft to return to the form editor. Configure any additional form settings and click FINISH. 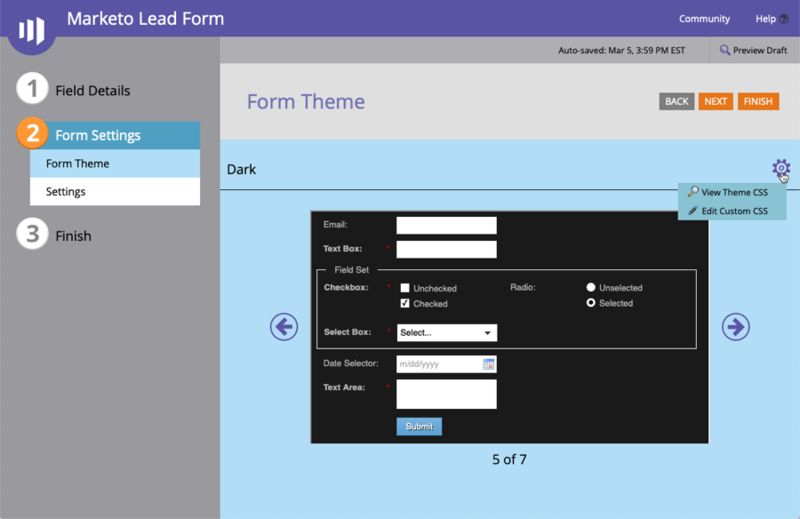 When creating a form, Marketo provides the ability to select a form theme to provide some basic form styling. You can also customize the form using your own custom CSS. In this section, we will customize the Dark theme and make the label text white and bold. For complete details on Marketo Forms, see the Marketo documentation. Navigate to Design Studio > Forms and then click on your form. Click Form Settings and then click the gear icon. Clicking View Theme CSS will display the current theme CSS. Click Edit Custom CSS. Paste in the following CSS code to make the label text white and bold. Note: Enter only your custom CSS (just the parts that are different). You don't have to paste in the entire theme CSS. Click Preview Draft to see a preview of the form. The label text should be white and bolded. Click FINISH and then APPROVE AND CLOSE. To use the form inside of the Audience module, you will need to copy the form embed code. In the left navigation, right click the form and click Embed Code. Set the Code Type to Normal and then copy the Code to the clipboard. Click Close. 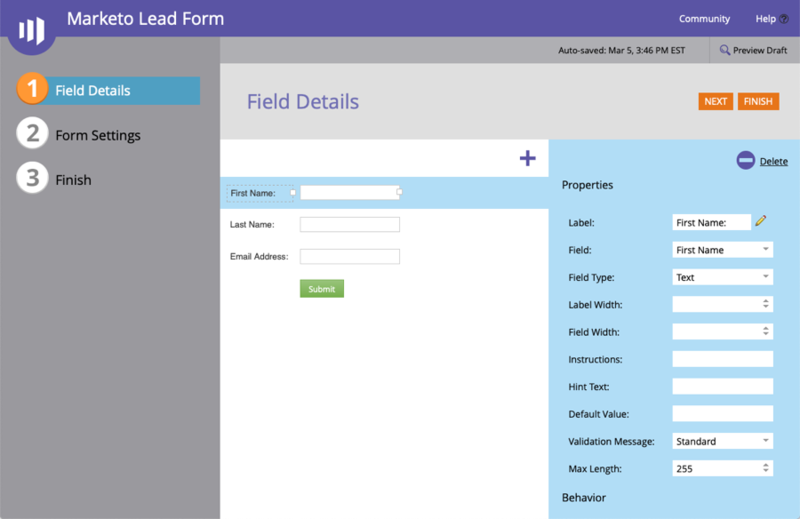 Once the form has been created and styled, create a custom lead form in the Audience module and associate the lead form with an Audience-enabled player. 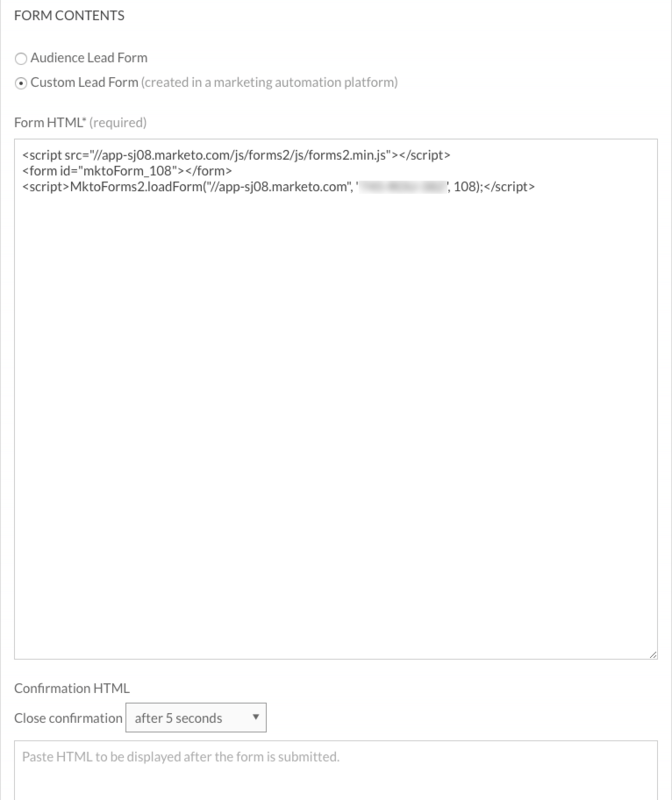 Paste in the Form HTML from Marketo. There are several ways to validate that the form data has been passed to Marketo. 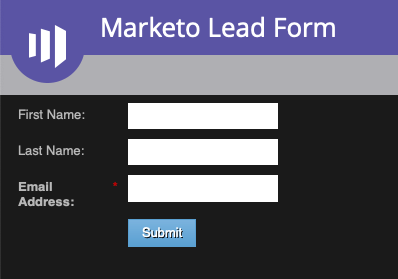 Follow these steps to view the form data in Marketo. 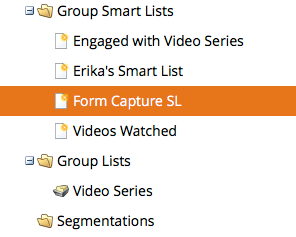 In the left navigation, expand Group Smart Lists and then click Form Capture SL. Click the Smart List tab. In the list of Filters on the right side of the page, locate the Filled Out Form filter. Click and drag the filter to the page. Enter the name of your form. You can also click the + to browse for your form. 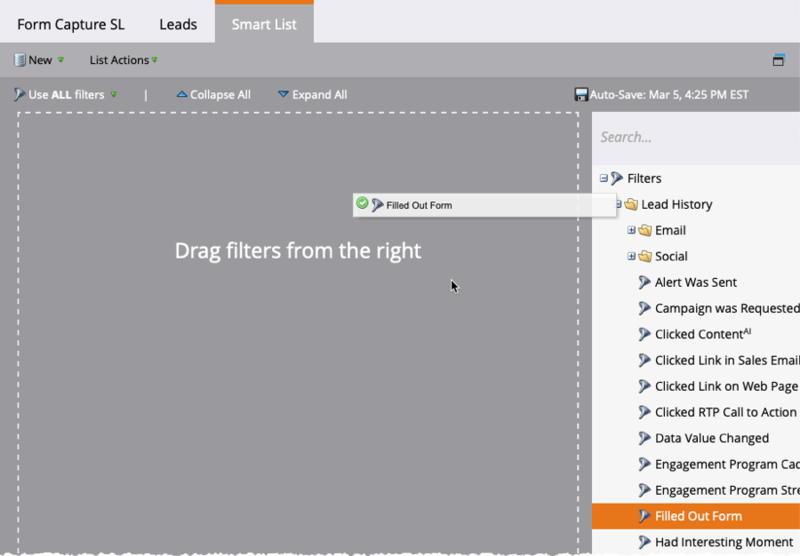 Click Leads at the top of the page to see the filtered lead data. Click an Id to open the lead detail. Click the Activity Log tab. Confirm that the form was filled out.